Fujishima oyakata greatly honoured us by granting several minutes for a private encounter in his dressing room at the Olympic Museum, on Saturday April 6th 2005. 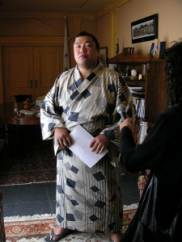 Le Monde du Sumo: To start with, we would like to thank you for granting us this interview Fujishima oyakata. This is an honour for us. LMdS: What was your favourite sport when you were a child? Was it already sumo? FO: I started doing sumo in the 4th year of primary school when I was about 10. Until then I practiced swimming and baseball, but my father was an amateur sumo wrestler and that is why I started doing sumo too. LMdS: Who were your idols at the time? LMdS: Did you enter sumo because you were passionate about it, or was it to please your father? FO: At first I didn't like sumo since I wasn't very strong. But the more I trained the stronger I became and the more I loved sumo. I decided to completely devote myself to it. LMdS: Now that your career as a rikishi has ended, what are your plans? FO: For the moment I am a coach in a heya; I don't have my own heya yet. But in any case, I have no plans unrelated to sumo. LMdS: Do you intend to open your own heya? FO: Yes, I'd like that. FO: (laughing) Yes, that's it! LMdS: When you were still active, who was the wrestler you liked to fight the most, and whom did you least want to encounter on the dohyo? FO: The wrestler who was the closest to me, even in age, was Kaio. On the other hand, Wakanohana and Takanohana frightened me a little because they were very, very strong. LMdS: You suffered numerous injuries during your career which often handicapped you. Do you think you would have become a yokozuna without these injuries? FO: I don't think so. Those who had become yokozuna have also had to suffer through serious injuries, and they still became yokozuna. LMdS: We think that it would have been possible! FO: (modest smile) Oh, thank you. LMdS: What memories do you have of your yusho in the 2000 Haru basho, won with a record of 13-2, when you were a sekiwake? FO: It was a time where I was very confident and I felt capable of winning. 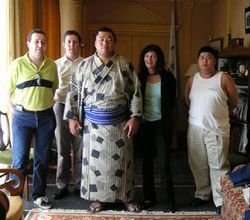 LMdS: What do you think of internationalisation of sumo, of the fact that the foreigners are being recruited? Do you think that sumo should be 100% Japanese? FO: I am very pleased that foreign athletes had come to sumo. Thanks to their cultural differences sumo has gained an additional richness. The Japanese should train more. LMdS: What exactly is it that the current Japanese wrestlers lack that prevents them from reaching the summit, in your opinion? The motivation? The training? FO: There are good rikishi and I respect them. But I think that Japanese wrestlers should work in accordance with their foreign opponents. Since foreigners train a lot, the Japanese should train even more, that's all. LMdS: It is said that currently there is a decrease in sumo popularity. Do you have an idea, a solution for refreshing the appeal of sumo, so that the audiences would return in great numbers to watch the sumo tournaments with enthusiasm? FO: I ascribe this decrease of interest in sumo on the arrival of very attractive sports in Japan, such as football and baseball. I think that the rikishi should train more in order to give good shows, to be good athletes, and be good role models. LMdS: Whom do you see as a future yokozuna? FO: I think there are many good rikishi, but I'd lean towards Tochiazuma or Kaio. LMdS: And among the youngsters, do you see some hopes? FO: Yes, Kotooshu and Hakuho, two foreign wrestlers. LMdS: Is this your first time in Switzerland? Did you have time for sightseeing? What are your first impressions? FO: I still didn't have time for sightseeing since I have just arrived, but I think that Switzerland is a very lovely country with magnificent landscapes. And the food is very good. LMdS: Do you have other interests, other passions beside sumo? FO: Since my retirement, I play golf. LMdS: Do you like cinema? What sort of films do you like? FO: I like going to the cinema a lot. The films I like are the ones about sport. LMdS: We found out that tomorrow you are going to be present at a championship of Swiss wrestling. Did you already have an opportunity to see it? FO: I have already seen the photos in books, but never the real thing. LMdS: Would you mind if we come with you to take some photos? FO: No, I don't mind one bit, please do. LMdS: We will leave you now to prepare for the exhibition that is starting soon. We thank you so much for devoting this time to us and answering all our questions!